Smells of sweet burning sage linger in the late evening and drift over the main camp on Highway 1806 at Cannon Ball North Dakota. Junior Cuero of the San Diego Campo Reservation chants the Bird Song, a mesmerizing, meditative and repetitive song of respect and honor to the Standing Rock people. A gourd rattle accompanies this ancient chant; a message given to the people by the Creator. Creator sent a bird to teach the People how to sing and dance and treat each other with empathy and not indifference. The sun is setting, bathing the campsite in warm light as the prairie winds begin to calm, and people gather around the campfire, feet tapping in rhythm. There are two camps. One is located within the “official” reservation boundary and the second “main camp” with the majority of the protesters is located on U.S. Army Corps of Engineer’s land just north of the Cannon Ball River. The North Dakota Department of Emergency Services says it is not on tribal property, but the original treaty line was moved in 1889, so if you support broken treaties, you could call it illegal. In this case legality is in the eye of the beholder. The Dawes Act and the Allotment Act opened the reservations throughout the United States to settlement by non-Indians. The tribe maintains jurisdiction on all reservation lands, “including rights-of-way, waterways, and streams running through the reservation.” On paper, that is. See the history of the Standing Rock Sioux Reservation and learn more about the broken Fort Laramie Treaty that arbitrarily moved boundaries and tried to divide the Sioux Nation. Standing Rock lies just south of the pipeline’s path under the Missouri River. How do you stop an oil spill at a boundary drawn on a map? Ask the people of Saskatchewan, who are facing 66,000 gallons of heavy crude from a broken pipeline owned by Husky Energy, Inc. It is making its way downstream and threatening the drinking water of several communities. 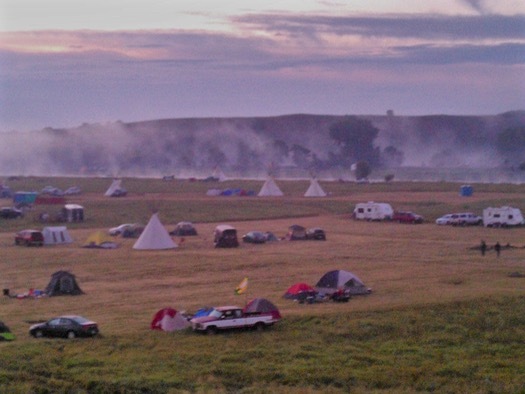 Despite local media accounts to the contrary, this gathering of Nations to protest the Dakota Access Pipeline are Spirit Camps of thoughtful prayer. There is no need to prolong the misinformation and outright lies perpetuated by the North Dakota Forum News Service. A governor steeped in the sticky flow of oil and money that has all but ruined portions of the North Dakota landscape feeds the news cycle with threats and lies about behavior at the encampments and issues emergency orders. Truth about what fuels the reactions of authorities can be found in the discarded detritus of the failed oil boom. Abandoned RVs form small mountains in salvage yards, wells are shut down, man camps are ghost towns, and the promises of great wealth are only memory. The loss of oil revenue dollars provokes great fear in the offices of politicians. The Dakota Access Pipeline is really another name for the “abandoned” Keystone XL Pipeline and the goal is to wring every last drop of Bakken crude from North Dakota. Authorities are reacting with anxiety that the pipeline will be compromised, and believe that concrete barricades along the main road to Standing Rock will stop the people from coming to protect their life source; water flowing from the mighty Missouri river. Descendants of the Massacre at Wounded Knee by the Seventh Cavalry come. Young riders, many teenagers, come on their horses—they are some of the Big Foot Riders who travel 300 miles every year to Wounded Knee to pay respect to the ancestors who were massacred by the U.S. 7th Calvary Regiment. 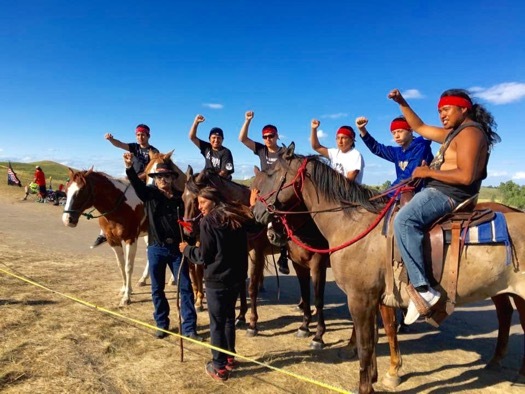 They, along with tribes from across the continent, do not want this pipeline that would involve 200 water crossings and pass through 300 sacred sites. They come. They come by car. Let’s for a moment reject the profane response of North Dakota authorities and focus instead on the sacred. So many have traveled great distances to stand in solidarity. Many Nations now united as one. Hazel Red Bird is 91 years old and a regal presence around the campfire. Many stop to greet her and share stories of growing up in Fort Yates. Red Bird is now back home at Standing Rock after living a good part of her life in Wisconsin. She is a true warrior woman, having enlisted in the Army Air Corps during World War II to train as a nurse at St. Mary’s School of Nursing in Pierre, South Dakota. The Great War ended just as her training did, and she began her working life as a registered nurse in the civilian white world. Red Bird surveys the gathering and says she is “amazed, thankful and humbled.” Then she glances down at the writer’s notepad to make certain those three words are written accurately. Red Bird is quiet for a moment as her eyes narrow and she surveys the movement of the people who have gathered around the green tent that serves as a food and information center. 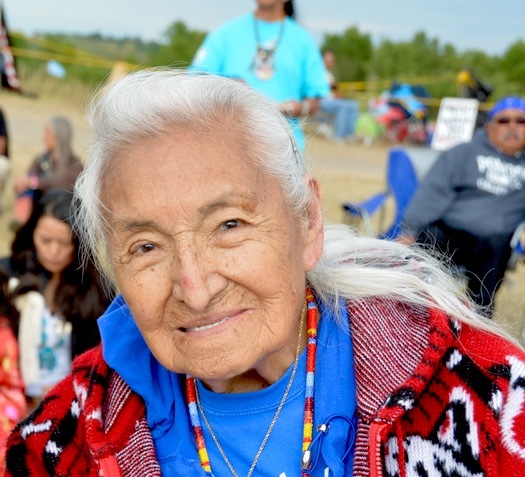 At 91, this elegant Lakota woman still projects a warrior’s stance. There is more to learn about this fascinating woman who is also a repository of the Lakota language, and you can read more here. There are other spiritual warriors who have gathered in joyful celebration and unity. 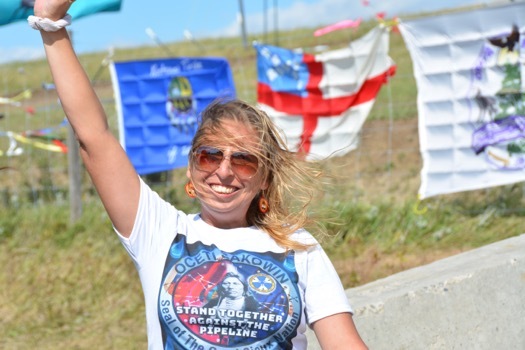 Several young women from the Crow Creek Sioux Tribe wanted to make it very clear that they “are standing for our water.” Their ancestors fought and died along the northern and eastern shores of the Missouri River. The Crow Creek Indian Reservation was established by executive order following what was known as the Minnesota Uprising, as a prison camp for the exiled Isanti Dakota and Winnebago people. These were the survivors, mostly women and children, of the largest known public execution in American History, “The Hanging of 38 Dakota Men at Mankato Minnesota.” From 1863 to 1866 approximately 300 died at Fort Thompson suffering from starvation, sickness, disease, exposure, hardship, and heartache. A federal judge will rule on the legality of the Dakota Access Pipeline on September 9. It remains to be seen whether the traumatic past will be repeated and define the present. How much can be endured; how much more can be stolen? This is a spiritual battle for generations to come. Clean water and air is a right, not an option. The bird song says this is true. Help find Sage (#0399) the 2-year-old, a loving home. She is the essence of the wild and wonderful Diamond range in Nevada. Sage holds a lot of native wisdom. We feel she would be a wisdom/lead mare in the wild similar to Blondie. She is a rare keeper of their secret knowledge who needs the right home and partner. She’s very friendly and longs to be with someone who will love and respect her. Sage will be easy to gentle through partnership and respect because she is so friendly, curious and has been in captivity for about a year. If you can take Sage and a friend then she would be so happy. We have found that gentling 2 at a time keeps them stress free because they have a buddy for comfort and it’s fun. This horses should not be confined to a barn for all her life. She will need a pasture with other horses to be truly happy. 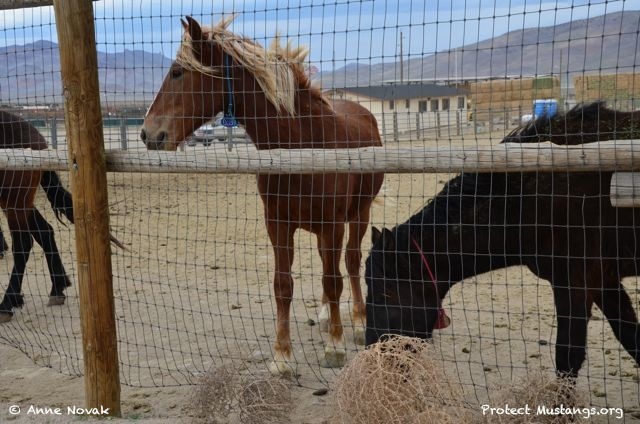 Sage is located at the Palomino Valley Center near Reno Nevada. Their number is 775-475-2222. You will provide transportation for Sage to get to you. One way to save transportation costs is to buddy up with other people who are adopting–get your friends to adopt some and share the hauling cost. You only need to provide tall fencing while she is being halter-gentled. Once she is gentled you can put her with your other horses. If you send her to a trainer to be gentled then the trainer needs to have the tall fencing not you because once you get her from the trainer she will be able to go with your other horses. Keep this in mind when you fill out the BLM paperwork. 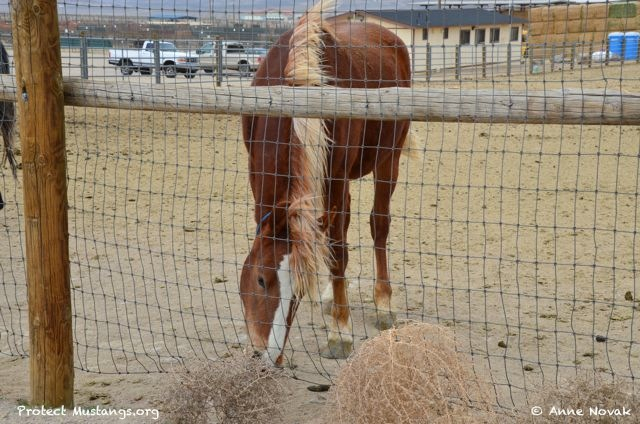 Training wild horses takes time, patience and love but it’s not rocket science. It is an amazing bonding experience of a lifetime. If you encounter BLM’s discouragement to adopt her please contact us. In the past the customer service at PVC has been bad. Let’s hope it’s getting better. 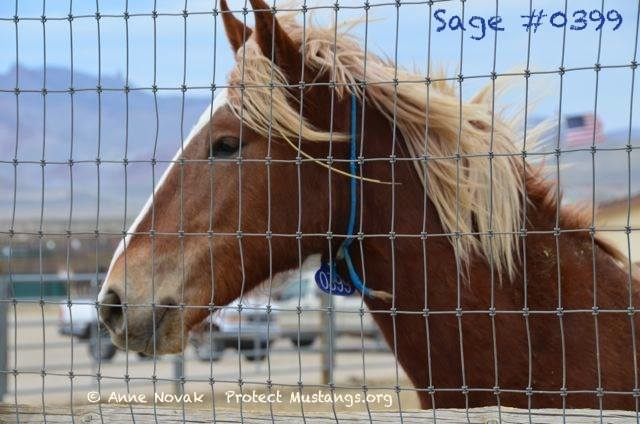 We will mark her adopted only when the adoption has been approved by BLM Until then it’s important to keep sharing until Sage finds her partner. Remember Sharing is Caring. Thank you for helping Sage!